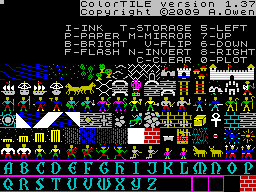 Remarks Developed from the earlier Timex Mode 2 Tile Editor (available from the CSSCGC2008 archive). Will not work at all on non-Timex hardware as it uses Timex specific keyboard reading. Requires a TC2048 or a TC2068 with Spectrum emulator cartridge.